How can the Cooperation and Verification Mechanism (CVM), imposed on Bulgaria by the European Commission in the area of judiciary and home affairs, be used more effectively to achieve better results and ultimately to achieve its goal - rule of law and working rules in Bulgaria? This question was discussed by diplomats, representatives by the non-governmental organizations, journalists and citizens at a round table, organized by euinside and blogeurope - the blog of Vladimir Shopov, a political analyst. In the very beginning of the discussion the spokesperson of the Ministry of Foreign Affairs Ms Vessela Tcherneva sent a very strong message on behalf of the Government about its change of attitude toward the Mechanism. She described it as a “mirror”, showing us clearly where we were. But it is not an imperative, but rather something that we believe has to be done. According to her, this new attitude was the first change, demonstrated by the new government. TEXT OF THE VIDEO IN ENGLISH: "We have perceived the latest interim report not in the usual hyerarchy order as it used to be until recently, according to which we have a stick above and the country, which is below, is reacting positively or negatively but is reacting either way to this imperative from above. Our vision was that the CVM is more or less a tool which stays sidelong. In other words, the country is trying to make the best of its efforts to overcome the shortcomings in the system (rule of law, judiciary and its functioning, fight with organised crime and corruption) and from this point of view the CVM is a mirror, helping us see where we stand. But this is no longer that imperative, forcing the system to a certain direction. On the contrary, our idea is that it is what needs to be. The CVM gives us tools to measure our success or failure", Ms Tcherneva added. 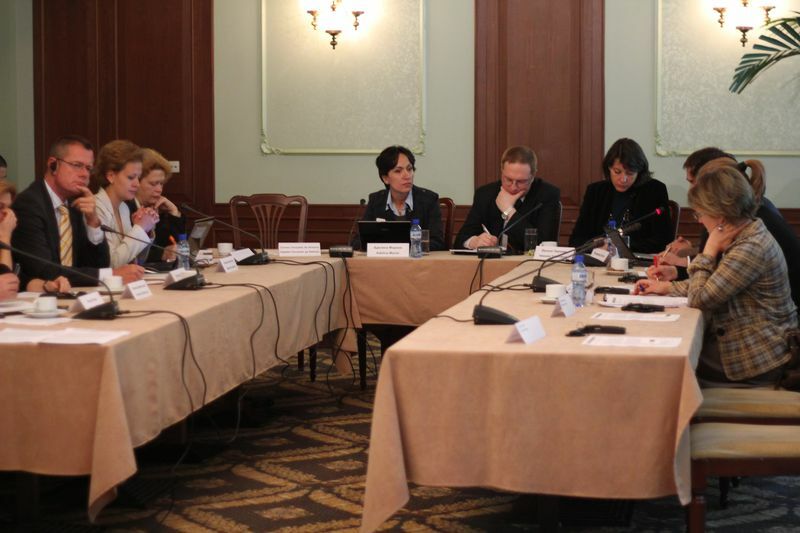 The Director of the European Institute Lyubov Panayotova reminded that the CVM was imposed in the very last minute, in December 2006, when the choice was either postponing Bulgaria’s EU membership with one year or doing something after it appeared that negotiations' chapters had been closed hastily. One of the most serious benefits from the CVM was its disciplining effect, because civil society had started to demand more and set higher criteria, Ms Panayotova said. The sociologist Boryana Dimitrova from Alfa Research Agency shared just the opposite opinion. According to her the society is not seriously informed and doesn’t understand neither the Mechanism itself, nor the reports of the European Commission. Ms Dimitrova raised a very important question: when in a moment in the future the CVM is gone, would there remain forces, resources and capacity in Bulgaria for pressure - both by professional circles in the judiciary and also by the civil society. TEXT OF THE VIDEO IN ENGLISH: "There is some kind of an overlap between the monitoring and the public opnion. On the one hand when Brussels releases its report, saying that the judiciary doesn’t work well, that sentences are expected, this is echoed in the public opinion as well. And people say - ahaa, this is really not good. 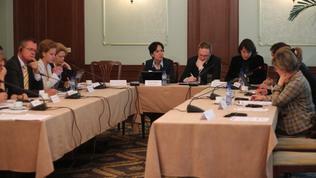 We all are aware that the voice of Brussels is particularly strong in Bulgaria. On the other hand, the report sometimes quotes data of the public opinion which is Brussels’ insurance that it will not look as if it is imposing something on Bulgaria, instead it says that according to the Bulgarians so and so. And here we have a vicious circle. For me the main issue is how is this making us progress and how? Because the problem with which today’s discussion started is that at some point in the future the CVM will be removed. Will then Bulgaria have the strength, resources and capacity to continue with the pressure". Ms Dimitrova also said something that was missing until now in the overall evaluation of the problems in our judicial system, made by Brussels and by the local civil society. “When the mother party has withdrawn from the judicial system after 1989, the system had to build its own internal self-regulating mechanisms. Such were created over the years but with much less weight than the division of the judicial system of individual feudal estates.” So one of the most serious problems is whether there is any self-regulation potential within the judiciary. According to the sociologist, however, the answer is rather negative. The analyst from the Open Society Institute Marin Lessenski also stressed that it was very important where the public could derive internal resources for change from because the fundamental problem of monitoring was that it was a center of external control. It was very important this "mirror" (after the words of Ms Tcherneva) not to distort the image as there were attempts deficits in one sector of the entire system to be overcome by hyper activity in another direction, Marin Lessenski said. He meant the numerous police actions at the expense of a lack of reforms in the judiciary. Mr Lessenski quoted data from an Open Society Institute research, according to which respondents to the question "What progress the government has achieved over the past year“ answered internal order, in the first place, and security. Probably citizens meant current police operations because judicial reform goes much further down in the answers, Mr Lessenski added. He made a logical parallel with the Greek crisis, which was “not so much a financial one but it resulted from constant violation of laws and rules that are being taken for granted in the EU”. "Actually the CVM in the area of justice and home affairs, applied for us now will be imposed on Greece too, because the idea is to follow the implementation of public policies - how the statistics is being organized, how the public finances are being spent.” What is currently available as ideas for economic governance within the EU are in fact measures to monitor the euro area Member States, the analyst said. In this sense, an interesting point of view was presented by the representative of the Dutch Embassy Andri van Mens. According to him, the CVM can be considered as a signal that a similar instrument is being discussed to cover all Member States. The crisis in Greece showed indeed how much European countries are dependent on each other - not only financially but also in the field of justice, Mr Van Mens said. TEXT OF THE VIDEO IN ENGLISH: "I would bring forward the hypothesis that we are at a stage, although quite difficult in the integration of the EU, where in the area of the CVM there are certain integrational processes going on. And I would mention that within the framework of the discussion on the Stockholm programme the Minister of Justice of the Netherlands brought forward the idea of a rule of law monitoring (naming and shaming). After all if we are to integrate deeper, having rights for free movement and free trade, we will inevitably encounter problems with justice not only here but in other Member States. Therefore we must have mutual confidence in our systems. So, from this point of view the CVM is a signal that something is going on beyond it". "The Mechanism is not a 6-month ritual", Mr Van Mens added. It should be ended when the work is done, i.e. when we end up with functioning judiciary. For this purpose, however, you could not reform the judiciary only - there are some stages before it, which also must function, the diplomat stressed. The journalist from the Capital weekly Rossen Bossev also says that although there are some attempts for a reform in the judiciary what really lacks is a reform in law-enforcement bodies - the Ministry of the Internal and the Prosecution. And a large part of the problems in the judiciary come from this sector, the journalist thinks. There are ideas for reforms but without a thorough analysis of the problems. In the meantime, absolutely blindly judges are blamed for slowing lawsuits down. "No one is paying attention to the fact that in Bulgaria the final sentences are over 90 per cent. I think that the balance could quite easily be broken, especially given that current efforts of the government meet the European Commission's support, saying with no criticism at all "Go for it!" But in the same time, when discharges start to emerge maybe again the courts will be to blame for reading discharges without evidence", Rossen Bossev added. He gave a very eloquent example with judge Peter Santyrov from the Sofia City Court who was caught with a bribe. And before that he was presented as one of the judges that might be enlisted to work with the new specialized court for organised crime and corruption cases. "This is the man who arrested suspects, never released them and in the same time we see that he was obedient, maybe because he was dependent", the journalist noted. In the same time there are people in the Prosecution from the encirclement of the former Attorney General Nikola Filchev who are still in the system and influence the work of young prosecutors. In the Ministry of the Internal a lot of people go up in the hierarchy no matter the fact that they have done nothing in the fight with organised crime in the years. The three major pillars in the Ministry - investigation, guarding activities and operational work continue not to work together but even in spite of each other, Rossen Bossev said. Therefore, he thinks, that a possible broadening of the monitoring to cover these issues too could help the Ministry of the Interior and the Prosecution the way it helped the judiciary. Ministry of Foreign Affair's spokesperson Ms Tcherneva disagreed however, with the idea of broadening the scope of monitoring. She said that this could happen only if we "adopted" it before that - in other words if it could become part of our internal system for evaluation, planning for structuring the reform. And when we stop perceiving the CVM as a 6-month ritual (after the words of Mr Van Mens) but rather as a "scaffolding" which supported and centered the reform. "But to ask the EU to get deeper and wider in on behalf of an external player is not only not serious but it does not seem efficient to me", Ms Tcherneva added. The diplomats of Britain and Germany shared the same opinion. Stuart Peters from the British Embassy in Bulgaria underlined that the CVM was not something imposed on Bulgaria but just a framework with which the EU was helping and directing. The purpose of the mechanism was to achieve results the entire society would benefit of, Mr Peters stressed. Similar position was expressed by the representative of the German Embassy Dietrich Becker. He noted that the mechanism would have been better if Brussels held a clearer and a more sincere discussion on the problems of the country. Most outspoken on solving Bulgaria's problems should be representatives from the civil society who should insist on resolving all issues. Mr Becker expressed Germany's satisfaction from Bulgarian government's position not to raise the issue to remove the mechanism. Because, he said, from a removal of the mechanism would not benefit the citizens but all those "who abuse the system for the last 20 or 25 or 40 years". In the context of Greece, which constantly surfaced throughout the discussion, Mr Becker presented the European vision of a state with rule of law as part of its economic development. According to him, with or without the mechanism Bulgaria is a subject of daily monitoring by investors, foreign direct investments (which, by the way, were the main driving force of the fast economic growth of the country for the last 6 years) and the entire world. If investors do not have confidence in a country they do not invest and we all see where this led Greece to. This is why, he stressed, reforms must continue even after the Mechanism and go much beyond it. Antoaneta Tsoneva from the Institute for Development of the Public Environment was the most staunchest defenders of the CVM, pointing it out as "an important instrument in the hands of the reformist community in Bulgaria" and as a milestone, helping us not forget which the real values were. Because, she said, society in Bulgaria was getting lost quite easily. In only a few words she managed to describe how this was happening - through media, business, new politicians. In order to illustrate better her thesis she gave the example of Putin in Russia. TEXT OF THE VIDEO IN ENGLISH: "This instrument can be looked upon and be interpreted brutally in several ways. The first one is why such an instrument has been imposed by our European partners? Because they needed additional guarantees that we would invest efforts to prevent organised crime in Bulgaria have an access to the European funds or at least to control such an access. The second reason is internal - how is the instrument being used? From what we have seen so far, it is being used by Bulgarian governments the following way: the 6-month reports are awaited with great hopes, various diplomatic shuttles are being used to soften the assessments in the reports because it is an instrument, legitimizing the Bulgarian government before its own voters. For me, as a person working in the non-governmental sector, this mechanism is important because, aside from everything else, it is an instrument in the hands of the reformists’ community in Bulgaria. I assure you that here direction is being lost quite easily and as easily certain values are being replaced with others unless there is no external pressure. And I will give you the following example - yesterday (Sunday, May 16) I heard on one of the national TVs a senior politician in the company of a an influential businessman, explaining that the best way to make politics in Bulgaria is by making political projects. They did not say who should make such projects but recommended as a very good practice new people to enter politics, showing from nowhere just like Putin in Russia. Who knew who Putin was (a KGB officer) before he was selected to be the president of Russia? No one, the senior official said and the influential businessman nodded affirmatively. Because we still have no grounds to help us compare such statements that irradiated Bulgarians on a Sunday evening", Ms Tsoneva added. In conclusion the political analyst Vladimir Shopov commented with a large dose of skepticism that the most important task for Bulgaria was to transform the discussion of the problems, treated by the CVM, into several different but parallel debates. Mr Shopov added that the current crisis was testing the EU in an unprecedented way and currently we had no clear perspective how this process might end. Because confidence in Member States, which had not been put into doubt so far, should be in the future strongly instrumentalized and imposed. And what impact this might have over the Union we are about to witness. TEXT OF THE VIDEO IN ENGLISH: "I am keeping part of my pessimism for the ability of the government to hold its cooperation with this mechanism, because sooner or later the CVM will be bound to other foreign policy targets of the government. I am not sure whether this short-term success the CVM to be kept away from Bulgaria’s aspiration to Schengen will not resist the current situation. Because we might end up in a situation when the very existence of the CVM could prove an obstacle for the achievement of other foreign policy targets. I think that the crisis in the EU at the moment is part of a very difficult process, which is transforming this external conditionality into an internal one. But my impression is however that these problems, especially in the eurozone, will test in an absolutely unprecedented way the Union and currently we have no idea how this process will end. Exactly because what was so far perceived as confidence in a large part of Member States, including in countries like Bulgaria, was confidence which developed in a very optimistic environment - of economic growth, lack of doubt that the West has the leading role in the world. But now we are losing grounds and this confidence has to be strongly instrumentalized and imposed. But what impact it would have on the EU remains an open question", Mr Shopov concluded. We believe that our decision to organize a discussion on exactly this topic was a right one because all participants had a position, they shared it with the rest, there were agreements and disagreements, but there was unanimity that there was a need of such discussions. The two hours which we planned for it seemed not enough to debate on all problems and to hear all positions. We invited politicians to take part in the discussion as well but they did not come. Which, on the one hand, shows their attitude towards issues which "are far from spotlights". But on the other hand, this gave the debate a chance to be free and open, unencumbered with political theses and party positions. It was also interesting to note the lack of interest of media and that even though there were colleagues who spent two hours of their working day in order to participate, did not found what to tell their audience. However, such attitude will not discourage us, on the contrary - as a media founded and working pro bono we will continue to defend our position that all important for our society issues should be raised and we should all together look for their solution. Because we want to live better in a better country and to be sure that those whom we have elected will defend our interests and not theirs. Isn't this the essence of European values which we apprehended with vigour as our own on January 1, 2007?